← A hunting we will go! After driving almost 600 miles on Friday, I was ready for some tiger beetle action. A quick 2-hour drive this morning got me to the first set of localities in extreme southwestern Nebraska and just across the border into Colorado (“B” thru “D” in the previously posted map). Compared to the other localities I have lined up for the trip, these were the most vague – based on published records from more than a century ago with no recent ‘ground intelligence.’ I wasn’t too concerned about having success at these spots, I just wanted a potentially interesting area to explore after a day of driving before completing my voyage to the first real target areas up in the northwestern corner of Nebraska. I could’ve taken a more direct line along I-80 and explored areas along that route, but I’ll be exploring that route on my return trip. My first stop at Benkelman was a bust – I was looking for some sand blows in the hopes of finding Cicindela limbata, but a half hour of so of driving around the area turned up nothing. I stopped at some exposed clay to see if I might encounter C. denverensis but only saw a couple of the ubiquitous C. punctulata. Haigler – a half hour to the west – was more productive. I found a spot with access down along the Republican River (at only 2 yards in width, it is beyond me how this qualifies as a “river”) and found several typical sand associated species – C. scutellaris (pictured) and C. formosa, both nominotypical forms which look very different from the populations we have in Missouri, and several C. tranquebarica individuals that show the bold markings characteristic of the northern Great Plains subspecies kirbyi (the first time I’ve seen this subspecies). My 104 year-old literature reference suggested C. fulgida occurred around salt marshes in the area, but no such habitats were found – probably degraded long ago, or even worse obliterated in the interest of “improving” the land for agriculture. Another half hour drive got me to Wray, just across the border in Colorado, where C. limbata again had been recorded from sand hills above the Republican Trickle. These sand hills were easily located, but the completely barren blows that the species requires, again, were not found – probably allowed/encouraged to grow over. As it was now the heat of the day (a very pleasant low 80’s), the common sand species C. formosa and C. scutellaris were now digging in to avoid the heat. Although it is well known that adult tiger beetles dig burrows to spend the night, I haven’t really seen much in the literature that talks about their daytime burrowing habits, how to recognize the burrows, and how to dig them out (okay, so now my double entendre of a title makes sense, cuz you see I really ‘dig’ tiger beetles… and I’m digging them from their burrows… oh well, it seemed funny when I thought of it). 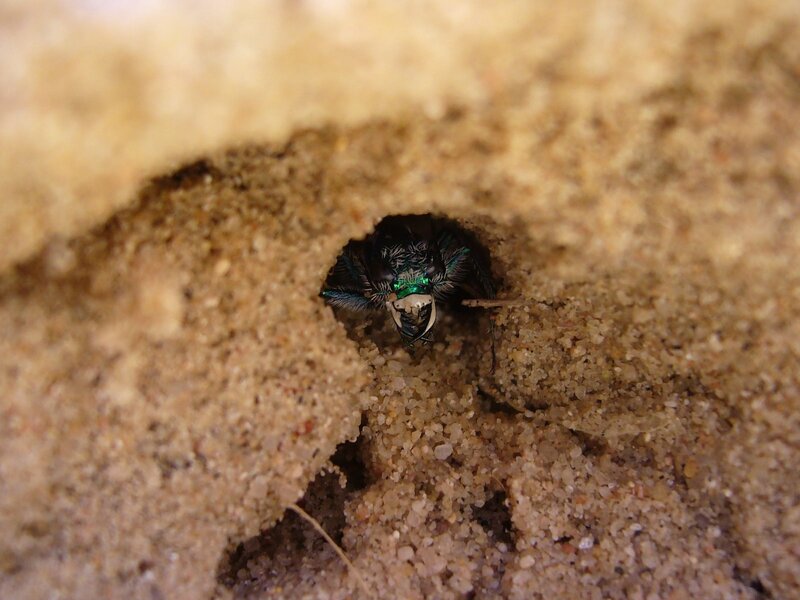 Many other insects also burrow in the sand, and some of them – especially those of the many ‘digger’ wasps and ground nesting bees – can look very similar to (and sometimes outnumber) those of tiger beetles. 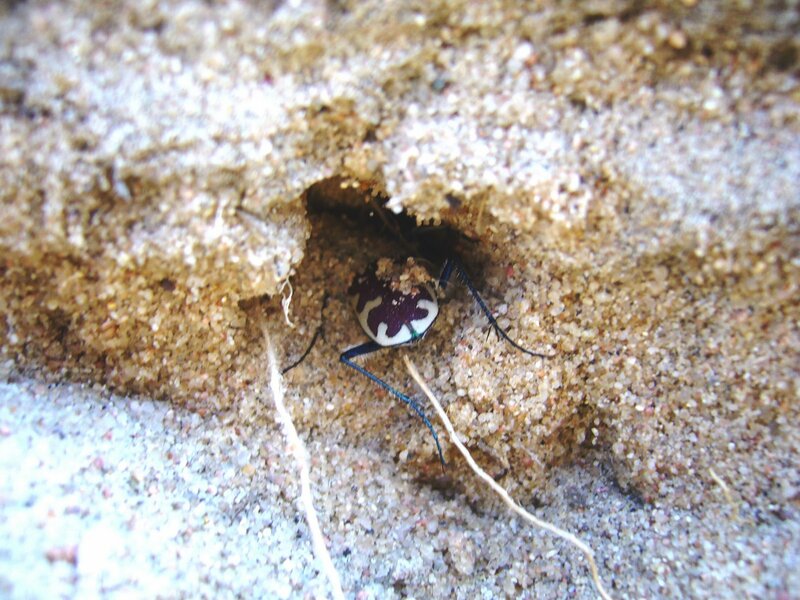 In my experience, adult tiger tiger beetle burrows have a more ‘flattened’ aspect to them (1st photo), while those of wasps and bees are more rounded. Fresh burrows from both groups will have moist diggings thrown to one side (in old burrows – often uninhabited – the diggings will be dry), but those of tiger beetles appear more ‘fanned’ while those of hymenopterans are more ‘piled.’ I use a knife to excavate the sand away from the entrance in thin vertical slices (2nd photo), slightly undercutting the burrow to prevent sand from falling into it (and making it impossible to follow). 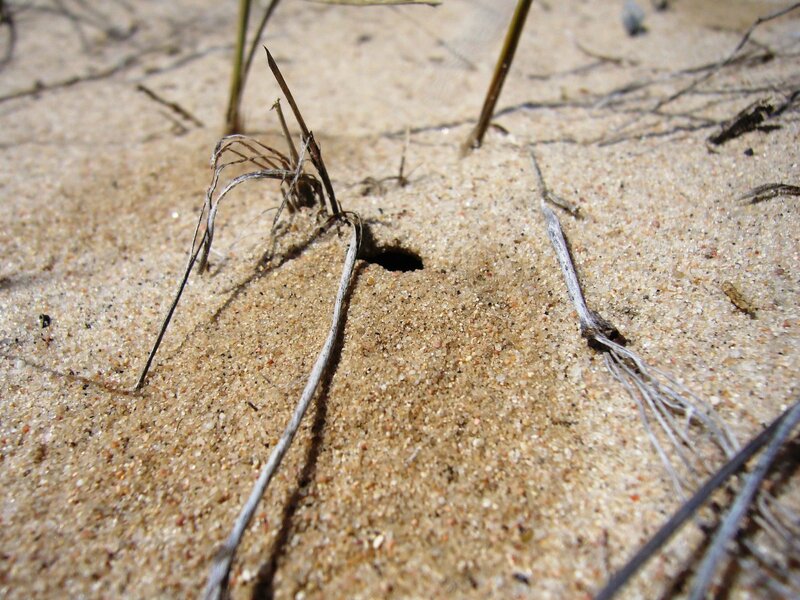 Wasp and bee burrows look more round during excavation and often make a hard turn downward, while those of tiger beetles continue looking very flattened and usually stay rather shallow. 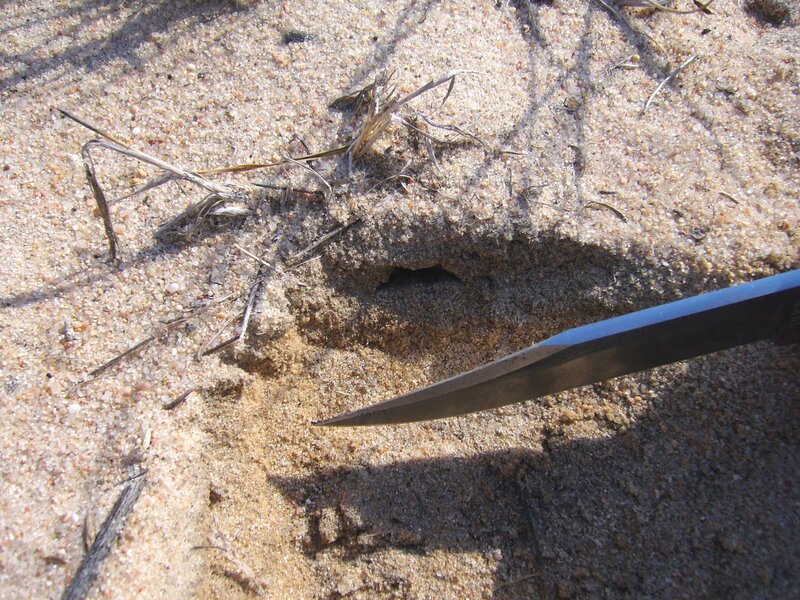 If somebody is home, they will be encountered without too much digging – these photos show a C. scutellaris adult peaking out head first and a C. formosa who was still in the act of excavating (done by kicking the sand backwards while backing towards the entrance). I stumbled onto this technique last year during my first encounter with C. limbata – had I not done so I probably would’ve walked away with only a single specimen. 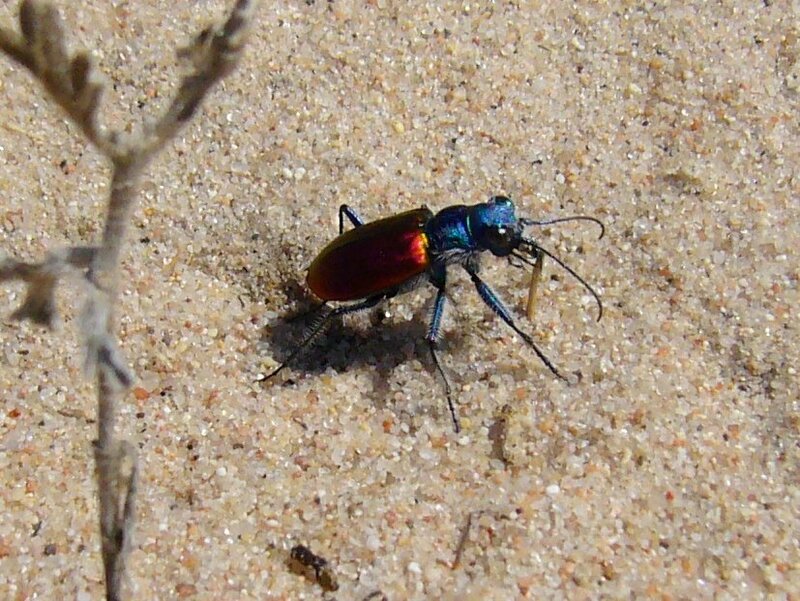 This entry was posted in Cicindelidae, Coleoptera and tagged beetles, Colorado, entomology, insects, nature, Nebraska, science, techniques, tiger beetles. Bookmark the permalink. Again, great post and great pictures to illustrate your points. One thing I would love to do is discover a time machine that would take us biologists back in time to see what the landscape used to look like before ecosystems were “improved” by us humans. I’m sure the whole country would look very different than it does now. cedrorum – that’s why I enjoy writers such as Schoolcraft so much – the view from the past combined with the eloquence of the pen makes for wonderful visualizing of those unaltered landscapes. Sounds like you are having a fine trip. I’m envious. I’ve only ever seen C. lengi once. It was earlier this year in Colorado, but substantially west of where you were for this post. I really like the C. scutellaris photo. It’s much prettier than the subspecies we have here in the Great Lakes region. Happy hunting! moe – thanks for the kind comment. Doug – it seems like many of the western subspecies are more brilliantly colored than their eastern counterparts. I’m sure there must be some theories why, but I don’t know – certainly must have something to do with the generally more wide open substrates.